Canadian sounding rocket. The Martlet 2 series were the primary 16" gun-launched sub-orbital flight vehicles used during the High Altitude Research Program (HARP). Martlet 2's were used to conduct extensive research at altitudes of up to 180 km with some 200 flights being conducted between 1963 and 1967. The very low cost per flight, about $3,000, made it ideal for a wide variety of applications. Typical mission payloads included chemical ejection to produce an observable atmospheric trail and assorted sensors with multi-channel telemetry. Status: Retired 1967. First Launch: 1963-01-01. Last Launch: 1967-06-22. Number: 148 . Payload: 84 kg (185 lb). Gross mass: 190 kg (410 lb). Height: 1.68 m (5.51 ft). Diameter: 0.13 m (0.42 ft). Apogee: 180 km (110 mi). The Martlet 2 series was a remarkably effective and reliable launch vehicle with a nearly perfect operational flight reliably record. The primary advantages of the Martlet 2 was its versatility and its very low costs which allowed hundreds of flights with a wide variety of payloads to be flown. The Martlet 2 series primarily consisted of the 2A, 2B, 2C vehicles. These were similar in size and appearance, differing only in the mission-related modifications and materials used in their construction. The typical Martlet 2 was a dart shaped vehicle 13 cm (5 inches) in diameter and varying in length from 1.27 m to 1.68 m (50" to 66"). The vehicle was stabilised with four fixed fins which were welded to the main body and beveled to induce spin. The normal flight weight of a Martlet 2 was about 84 kg (185 lb). with an all up shot weight, including the sabot, of about 190 kg (420 lb). The sub-caliber design of the Martlet 2 vehicles required the sabot to increase the shot diameter to the 16" bore of the gun system. The Martlet 2 sabot design used a pusher plate and discardable petal arms to support and stabilize the vehicle during launch. The original pusher plate was a full bore aluminum disk with a smaller steel load-spreading disk directly beneath the vehicle. This plate was manufactured slightly oversized and was forced into the gun with a hydraulic jack to insure a constant shot start pressure. To prevent the gun gases from escaping past the vehicle and insure that a good seal was maintained, a polyethylene obdurator disk was inserted behind the pusher plate. The original pusher plate assembly weighed in at about 50 kg (110 lb). Later versions of the pusher plates retained the same basic configuration although they were somewhat lighter. The sabot petal arms were used to insure that the vehicle remained in a stable upright orientation during the gun launching. Four petal arms were used, each occupying a quarter of the bore circumference . The original petal arms were made from sections of laminated plywood, machined to size. Later versions were made from aluminum and were much lighter. During a launch, after the vehicle and sabot exited the muzzle, atmospheric pressure would peel the petal arms away from the vehicle body, and the pusher plate would drop behind, freeing the vehicle for ballistic flight to apogee. Typically the sabot sections would fall within 6.5 km of the gun launcher. The primary scientific mission of the Martlet 2 series was to explore the meteorological, chemical and physical conditions of the upper atmosphere at altitudes above those attained by balloons and below those of satellites. At the time there was an acute need for detailed atmospheric information to support the design of high altitude supersonic aircraft and new missile systems. This mission was accomplished by a variety of experiments which included atmospheric measurement and atmospheric modification techniques. The Martlet 2 vehicles were designed to carry multiple payloads during a single vehicle flight, although the low cost per flight made it practical to fly single objective missions. The Martlet 2 gun launched glide probes differed greatly from sounding rocket-launched experiments, since they derived their entire propulsive impulse from the gun launcher. In this manner the entire vehicle could be dedicated to carrying payloads. There was no need for a integral rocket motor. 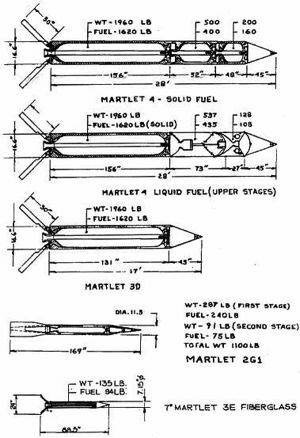 The Martlet 2 vehicles generally consisted of two primary components: the main body , which was typically used for ejectable payloads, and the nose assembly, which typically contained electronic telemetry instrumentation. The main body of the earliest Martlet 2 flights carried a colored smoke generator or a sodium/thermite package intended to leave a visible trail along the vehicle's flight path. This trail appeared as a thin line that extended up to 130 km altitude. If upper atmospheric winds were present this trail would be blown and contorted to match the air movements. Ground observation and analysis allowed the wind conditions over the trail's entire length to be determined In later flights an ejectable stream of hypergolic TMA/TEA (Trimethyl Aluminum /Triethyl Aluminum) was used which reacted with oxygen in the atmospheric to produce a visible trail of much better quality and longer duration. It was also not uncommon for these vehicles to eject clouds of radar reflective chaff and even meteorological balloons at high altitudes. The Martlet 2 nose cone payloads included magnetometers, temperature sensors, electron density measurements and even a Langmuir probe. For the electronic instrumentation to function properly after gun launching it was necessary to harden all of the circuitry prior to launch. This was typically accomplished by casting the entire circuit in a block of epoxy which prevented the components from moving and being damaged. In this way the Martlet 2 regularly carried complicated electronic instrumentation subjected to gun launching loads of up to 15,000 g's. Since the Martlet 2 derived its entire propulsive impulse from the gun launcher, the altitude achieved was solely dependent on the gun launch velocity. Early theoretical calculations indicated that with the original 16" L45 gun the Martlet 2 should reach an apogee of about 125 km. 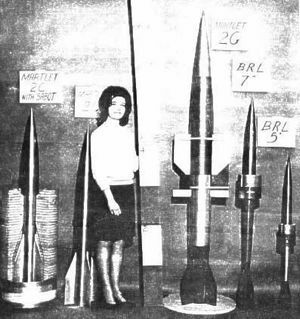 With the gun extended to a 16" L86 configuration, an apogee of some 200 km would be attainable. Early Martlet 2 flights tended to fall short of the theoretical altitudes, mostly due to poor performance of the 16" gun system. As the HARP program proceeded, there was a concentrated effort to improve the launch performance of the gun system. The improvements included: lengthening of the gun barrel; use of customized propellant grains; and unique charge loading and charge ignition techniques. These greatly improved both the performance and reliability of the of the system. Before long the launch velocity was increased from early velocities of 1400 m/s (4500 ft/sec) to nearly 2100 m/s (7000 ft/sec). The Martlet 2 regularly achieved altitudes in the range of 160 km when fired from the 16" L86 gun with flight times in the range of 320 seconds. Typically the vehicle would re-enter and splash down within 80 km of the gun launcher. Three decades later, a Martlet 2C launched from the 16"L86 gun stills holds the world altitude record for a sub-orbital gun-launched projectile. On November 19, 1966 a Martlet 2C was fired to an altitude of 180 km with a flight time of over 400 seconds. Payload: 84 kg (185 lb) to a 180 km altitude. Development Cost $: 9.000 million. Launch Price $: 0.003 million in 1965 dollars in 1962 dollars. Total Development Built: 200. Family: Gun-launched. Country: Canada. Launch Sites: Barbados HARP gun 16 inch, Barbados site, Yuma gun 16 inch, Yuma. Stages: Martlet 2-1. Agency: Bull. 1965 November 22 - . 23:09 GMT - . Launch Site: Barbados Site. LV Family: Martlet. Launch Vehicle: Martlet 2. MAXWELL Aeronomy mission - . Nation: USA. Agency: USAF. Apogee: 100 km (60 mi). 1965 November 23 - . 03:59 GMT - . Launch Site: Barbados Site. LV Family: Martlet. Launch Vehicle: Martlet 2. PARAGON Aeronomy mission - . Nation: USA. Agency: USAF. Apogee: 100 km (60 mi). 1965 November 23 - . 06:31 GMT - . Launch Site: Barbados Site. LV Family: Martlet. Launch Vehicle: Martlet 2. QUEENS FORT Aeronomy mission - . Nation: USA. Agency: USAF. Apogee: 100 km (60 mi). 1965 November 23 - . 08:28 GMT - . Launch Site: Barbados Site. LV Family: Martlet. Launch Vehicle: Martlet 2. ROCKLEY Aeronomy mission - . Nation: USA. Agency: USAF. Apogee: 100 km (60 mi). 1965 November 23 - . 10:16 GMT - . Launch Site: Barbados Site. LV Family: Martlet. Launch Vehicle: Martlet 2. SEAWELL Aeronomy mission - . Nation: USA. Agency: USAF. Apogee: 100 km (60 mi). 1966 June 15 - . 08:27 GMT - . Launch Site: Yuma. Launch Complex: Yuma gun 16 inch. LV Family: Martlet. Launch Vehicle: Martlet 2. Y-4 MCCONNELL SHOT-8 - . Nation: USA. Agency: HARP. Apogee: 114 km (70 mi). 1967 June 13 - . 03:14 GMT - . Launch Site: Yuma. Launch Complex: Yuma gun 16 inch. LV Family: Martlet. Launch Vehicle: Martlet 2. Y-26 TRAIL 38 - . Nation: USA. Agency: BRL. Apogee: 136 km (84 mi).